Final election results from the state Office of Elections is here. Gov. David Ige easily clinched another term as governor Tuesday night, finishing the race with a six-figure vote advantage over his Republican opponent, state Rep. Andria Tupola. Star-Advertiser. Gov. David Ige has won his bid for re-election, fighting off a general election challenge from Republican state Rep. Andria Tupola. Hawaii News Now. Ige Cruises To Re-Election As Governor. Incumbent Gov. David Ige and his running mate, Josh Green, easily defeated GOP challengers Andria Tupola and Marissa Kerns in Hawaii’s gubernatorial election. Civil Beat. Gov. David Ige on Tuesday won re-election to a second term after defeating Republican state Rep. Andria Tupola as the Democratic Party continued to dominate Hawaii politics. Associated Press. Democratic Governor of Hawaii David Ige has been reelected, alongside the next Lieutenant Governor, Josh Green, following Tuesday night’s general election victory. Big Island Video News. Gov. David Ige wins re-election, Josh Green to serve as lieutenant governor. KHON2. U.S. Sen. Mazie Hirono and U.S. Rep. Tulsi Gabbard easily won re-election Tuesday, and former U.S. Rep. Ed Case also is headed back to Congress, ensuring an all-Democratic delegation for the islands once again. Star-Advertiser. Case cruises to victory in race for Congress; Hirono, Gabbard easily win re-election bids. After beating out a crowded field of Democrats in the primary election, former U.S. Rep. Ed Case easily clinched his congressional bid Tuesday night. Hawaii News Now. Hawaii Democrats maintain their dominance but GOP picks up a state Senate seat. 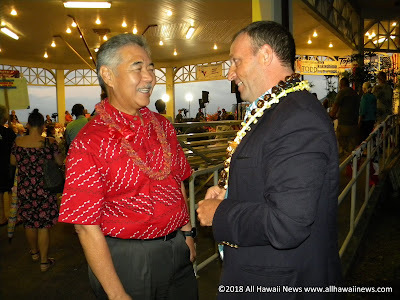 Republican Kurt Fevella beat Democratic rival Matt LoPresti late Tuesday night to fill the open Senate seat representing Ewa and Ewa Beach, giving the Republican Party a surprise turnaround in what was otherwise an evening of Democratic sweeps. Star-Advertiser. Democrats Keep Their Tight Lock On The Legislature. Republicans, who currently hold only five House seats and no Senate seats, appear poised to grab one Senate seat. Civil Beat. Hawaii Republicans retain 5 seats in state House. The seat that represents portions of Mililani went to a Republican newcomer. Hawaii News Now. Two of the three Hawaii teachers who jumped into politics this year are headed from the classroom to the state House. Star-Advertiser. Longtime OHA Trustee Akana Loses Re-Election Bid. Rowena Akana has served on the Office of Hawaiian Affairs Board of Trustees for more than two decades but recently came under fire for alleged misspending. Civil Beat. Longest-running OHA trustee, facing charges of ethics violations, fails in re-election bid. Hawaii News Now. Waihee, Lindsey, Akaka win OHA races. Two members of the Office of Hawaiian Affairs board of trustees will keep their positions with a new face coming to represent the island of Oahu. West Hawaii Today. Hawaii voters say ‘no’ to constitutional convention. Hawaii overwhelmingly voted down a proposed constitutional convention Tuesday. Hawaii News Now. A proposal to convene a state constitutional convention was soundly defeated Tuesday night. Tuesday’s balloting showed continued resistance to a ConCon, with over 70 percent voting “no” or leaving the question blank, which counted as a “no” vote. Star-Advertiser. ConCon Is Gone Gone — Voters Reject State Constitutional Convention. It was a once-a-decade chance for the public to go over the heads of the Legislature, but the measure was opposed by public employee unions. Civil Beat. Hawaii voters find short lines, few problems at general election polling sites. Hawaii News Now. Democratic Party of Hawaii says the work begins now, after election victories. KITV. Ozawa Edges Waters In Tight Race For Honolulu City Council Seat. Councilman Trevor Ozawa received 22 more votes than challenger Tommy Waters in a contest that went down to the wire. Civil Beat. Honolulu City Councilman Trevor Ozawa pulled off a 22-vote victory over former state Rep. Tommy Waters to win reelection to the Council District 4 (East Honolulu) seat, according to a final summary report issued by the state Office of Elections at 4:11 a.m. today. Star-Advertiser. Councilman Trevor Ozawa edges over Tommy Waters for city council seat. KHON2. One of the hottest races this general election is for the City Council seat that represents east Honolulu — and it’s proving to be a really tight race. Hawaii News Now. Voters Shooting Down HART Board Charter Amendment. The proposal would have made it easier for the board overseeing the Honolulu rail project to take action. Civil Beat. Rebecca Villegas will be the new face of Kona on the County Council. With all four precincts reporting Tuesday night, Villegas had 2,920 votes, or 56.6 percent, overpowering Kelly Drysdale for the seat vacated by Dru Kanuha. West Hawaii Today. Rebecca Villegas will be taking a seat on the Hawaii County Council, after defeating runoff opponent Kelly Drysdale in Tuesday night’s general election. Big Island Video News. Facing slim competition from challengers, Hawaii Democrats appeared poised to handily win all Big Island House seats Tuesday night. Tribune-Herald. New names assume state office in West Hawaii. Dru Kanuha, three-time District 7 county councilman, made the leap to the state Senate, capturing the District 3 seat vacated by Hawaii’s newly elected Lieutenant Governor, Josh Green. David Tarnas, who served two terms in the state House of Representatives from 1994-98, will assume the District 7 House seat after a hard fought primary rematch against eight-time incumbent, Cindy Evans, and a victory in the general over Republican Tom Belekanich by a total of 6,424 votes to 1,932 votes. West Hawaii Today. County charter amendments pass. Hawaii Island residents voted Tuesday for more oversight over raises for county officials. Another charter amendment requiring ballot initiatives that would change the charter to be accompanied with a fiscal impact statement also passed with 81 percent in favor. Tribune-Herald. Mike Victorino defeats Elle Cochran to become Maui County's next mayor. KHON2. In the Maui mayor's race, County Council veteran Mike Victorino led Elle Cochran 54.1 percent to 43.3 percent. Civil Beat. In a closely watched proposal to toughen penalties for operating illegal short-term vacation rentals, Maui voters were strongly favoring a measure to increase penalties for operating unpermitted short-term vacation rentals. Civil Beat. Voter Turnout Down, Maui at 52%. In Maui County total turnout was 50,475 or 52.2% of the 96,721 registered voters. This included 23,093 or 23.9% who turned out at the polls, and 27,382 or 28.3% who cast absentee ballots. Maui Now. Derek Kawakami ready to work as Kauai County's new mayor. Kauai will be seeing a lot of changes and Tuesday night will be the deciding factor. KHON2. In the race for Kauai mayor, former state Rep. Derek Kawakami led County Council Chairman Mel Rapozo 65.1 percent to 30.9 percent. Civil Beat. Rapozo falls short in mayoral race. Garden Island. County overwhelmingly votes to keep term limits. Here is how Kauai voted on seven ballot questions. Garden Island. Outgoing Kauai Mayor Carvalho Jr. discusses his next move. KHON2.